Women around the world are taking up jobs previously thought to be men's jobs. In the ring, battling flames or lifting off into space, women have entered professions generally considered to be men's jobs. For International Women's Day on March 8, AFP Photo and AFPTV met some 20 women breaking down the barriers of gender bias in the world of work. "In the beginning, my family told me: 'Stop, you won't succeed, this is a job for men,'" said Devrim Ozdemir, who did not heed the advice. In 2008, she became one of the first women to put on a firefighter's uniform in Turkey. "Today, everyone supports me, they have confidence in me," the 37-year-old said. Assigned to a fire and rescue brigade in the western city of Izmir, she has started a trend. Now there are 51 women firefighters, though they are still a small portion of the 1,200-strong force. "Today I am a firefighter who stands beside people in their difficult times," she said of her motivation. 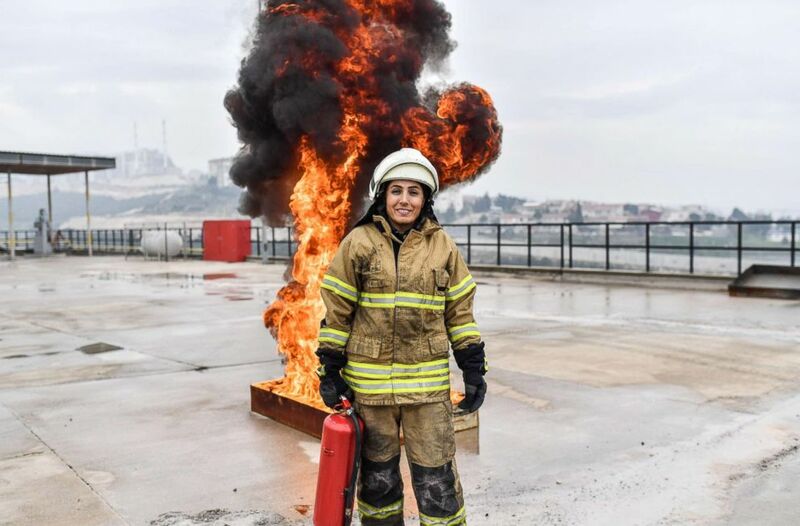 (Bulent Kilic/AFP via Getty Images) Devrim Ozdemir, a female firefighter, poses during a training session on Feb, 20, 2018 in Izmir, Turkey. And sometimes the firefighting itself can be physically tough. "It has been difficult at times, for example on interventions that require physical strength. I also faced challenges in carrying all our equipment, but apart from that, I never had any trouble." Ozdemir encourages young women to persevere in the male-dominated profession and points out that there is pay equality. "For me it is important, we could have received less money for the same job, but no, we have the same salary." Her enthusiasm, determination and pride in her profession also inspires youngsters, like her 6-year-old son -- instead of reading him bedtime stories she tells him about her work. "I'm a heroine to my son, it's an incredible feeling," she said, smiling, and adding proudly, "He, too, wants to become a firefighter." 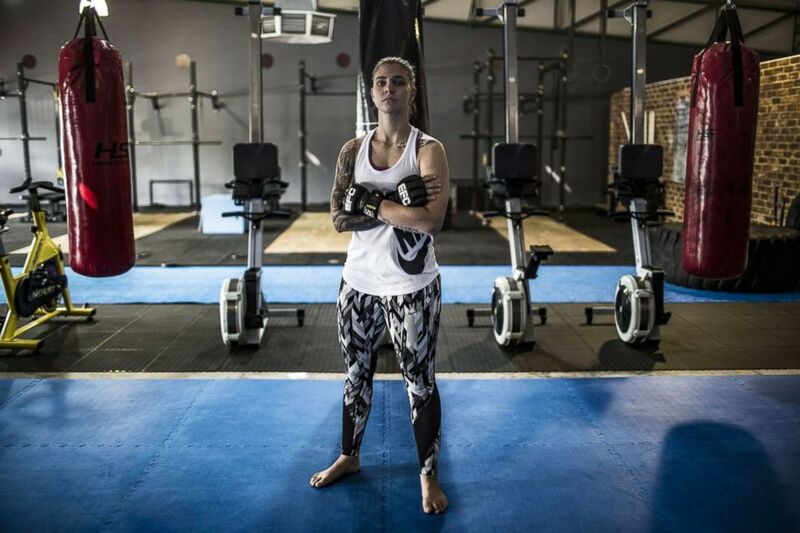 As the first woman amateur champion in mixed martial arts (MMA) in South Africa, Shana Power defies the stereotypes about women in a combat sport with her ferocity in the ring. She was nicknamed "Titanium." Born in Johannesburg, the 25-year-old blonde was first attracted to MMA by such star fighters as American Holly Holm and wanted to do the same in her homeland. "When I was growing up I was very athletic, I've always been sporty. So I understood that the mind was as important as the body ... if you can unlock the mind and build the mind then your body will be an unstoppable force." (Gulshan Khan/AFP via Getty Images) Shana Power, 25, a mixed martial artist (MMA), poses for a picture in the gym which she co-owns called Power House Intensive Training (PHIT), in Johannesburg on Feb. 28, 2018. Power says she was supported by the people who trained her in MMA and now trains and inspires others herself. "In my profession I've actually been quite fortunate. I haven't faced many challenges, for example, being a woman in a male-dominated sport. I've actually had a lot of positives from it." Except perhaps for the money. "I don't think we get offered the same," admits the champion, now a MMA professional. But she adds that "in terms of the personal training and coaching, yes," it's the same as for men. "I was 10 years old when Apollo 11 landed on the moon and that was my 'aha' moment as I like to say," said Wendy Lawrence, 58, a former NASA astronaut. "I looked at Neil Armstrong and Buzz Aldrin walking on the moon and thought that's what I want to do when I grow up: 'I'm gonna be an astronaut and I am gonna fly in space.'" A trained Navy helicopter pilot, she realized her dream, becoming an astronaut with four flights onboard a NASA space shuttle between 1995 and 2005. She grew up in Jacksonville, Florida, not far from Cape Canaveral, the launch pad for the space shuttles. "I think especially here in the United States, we like to say 'Well you throw like a girl or you run like a girl' and historically that's not been a very positive thing. 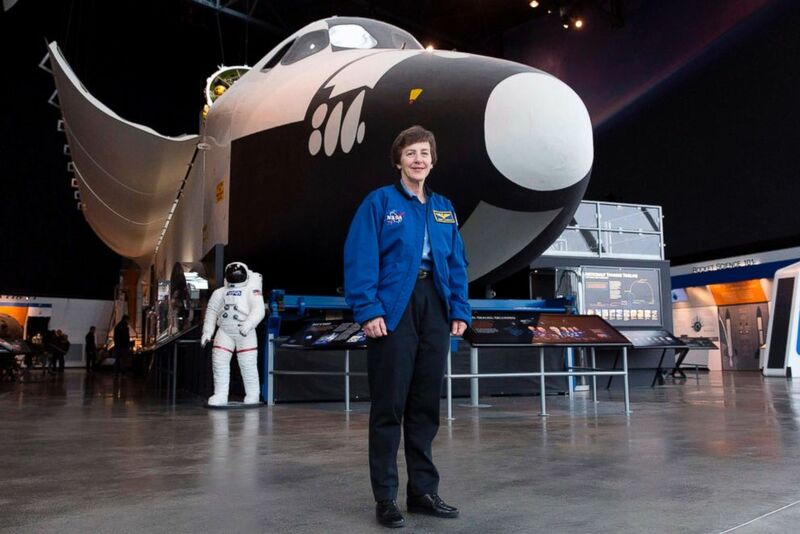 (Jason Redmond/AFP via Getty Images) Wendy Lawrence, 58, a retired U.S. Navy captain and former NASA astronaut, is pictured on the Space Shuttle trainer that was used for astronaut's training at the Museum of Flight in Seattle, on Feb. 28, 2018. "So I suspect that in the minds of some of my male colleagues, especially when I was going through flight school, they probably thought I was gonna fly like a girl," she recalled. That meant she had to "work harder to be perceived as better... I was willing to buckle down and be focused for a long period of time cause my mindset was: 'I'm gonna prove you're wrong.'" Lawrence retired in 2006 and said her advice is to avoid preconceived ideas about what women can do. "So I'd say give women an opportunity to try. You might be surprised at what they bring to the table, what they're capable of."